tomato puree (water, tomato paste), diced tomatoes in juice (tomatoes, tomato juice, citric acid, calcium chloride), onions, contains 2% or less of: red bell peppers, olive oil, salt, garlic, granulated garlic, granulated onion, spices, crushed red pepper flakes. In Rome, crushed red pepper creates a bold, spicy “Arrabbiata” sauce. Here, classic Penne al’ Arrabbiata means “Pasta Enraged” – a spirited sauce with red pepper to add spice to any meal. My previous review is supposed to be marked with five stars. 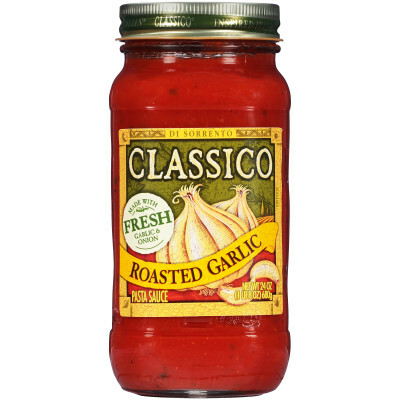 This is my favorite one of your red sauces. It has a nice kick without being too hot. And, it's only about 310 mg sodium per serving!